Saban Entertainment, Renaissance Atlantic Entertainment, Toei Company, Ltd., MMPR Productions, Inc.
Power Rangers Zeo is the third incarnation of the Power Rangers franchise, and the fourth season overall. This series was a direct continuation of Mighty Morphin Power Rangers and began the Super Sentai practice of annual Ranger suit changes. Alpha 5 appears to be caught in the destruction of the Command Center. Although Power Rangers was still performing well in the ratings, there was a noticeable decline from when it started and in merchandise sales. Saban Entertainment decided that a major shake-up needed to happen to the status quo to reinvigorate viewer interest. They ultimately settled on cosmetic and casting changes, allowing them to use new Sentai footage—which would cut their costs substantially—and generate a new range of merchandise. Goldar and Rito become maids for all their efforts. Zeo picked up right from where Mighty Morphin left off, with the Command Center having been destroyed by Rito Revolto (Bob Papenbrook) and Goldar (Kerrigan Mahan) during their theft of the Zeo Crystal. However, they dropped the Crystal in the chaos and lost their memories as a result, ending up the personal slaves of Bulk (Paul Schrier) and Skull (Jason Narvy) for half of the season until their memories returned. The Rangers and Alpha speak with Zordon in the new Power Chamber. 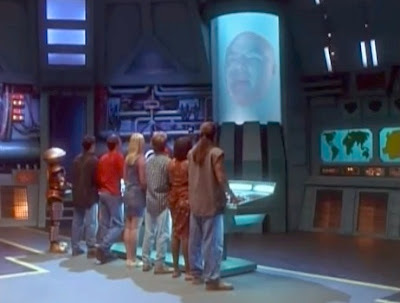 The Power Rangers discovered a second subterranean Power Chamber where Alpha 5 (Richard Steven Horvitz) and Zordon (Robert L. Manahan) retreated. The Command Center rebuilt itself while the power of the Crystal was used to restore the Rangers’ lost powers, turning them into the Zeo Rangers. However, since the power could only be split five ways, original Blue Ranger Billy Cranston (David Yost) opted to remain in a support capacity in the Command Center, where he felt he was the most useful, and allowed Tanya Sloan (Nakia Burrise) to take his place on the team. The Zeo rangers with the Zeo Crystal. 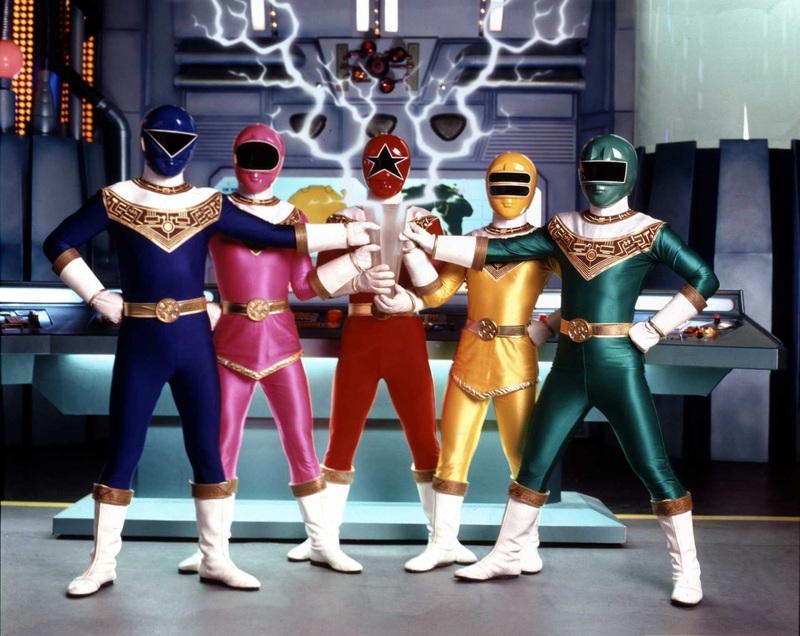 The team gained some new colors, with Tommy (Jason David Frank) becoming the Red Ranger, Adam (Johnny Young Bosch) the Green, and Rocky (Steve Cardenas) the Blue, while Tanya became the Yellow (who was actually a female this time) and Kat (Catherine Sutherland) remained Pink. The Rangers’ helmets featured a visor whose shape was reminiscent of the numbering Zordon gave them in their first transformation; from 1-5. Instead of Morphers, they now used Zeonizers to transform, which would materialize on their wrists when needed. With these new forms came new weapons: a sword for Tommy, hatchets for Adam, axes for Rocky, double clubs for Tanya, and a disc for Kat, as well as Zeo Laser Pistols and Blades. They could also combine their powers for a powerful attack from the Zeo Cannon. Along with new Zords, Billy and Alpha 5 developed Zeo Jet Cycles for additional transportation for the team, and a Defender Wheel that Tommy could launch from his Zord for a strong attack. The Royal House: Klank, Orbus, King Mondo, Prince Sprocket and Queen Machina. Meanwhile, in space, the dreaded Machine Empire was making its way towards Earth. 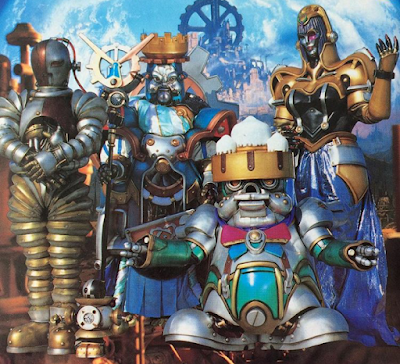 They were a massive race of mechanical beings led by the Royal House of Gadgetry: King Mondo (David Stenstrom), Queen Machina (Alex Borstein), and Prince Sprocket (Barbara Goodson). Later, when the House is in upheaval, the other son, Prince Gasket (Douglas Sloan), and his wife, Princess Archerina (Melora Harte) arrive to take over and continue the family’s work. The Empire had already conquered an entire chain of galaxies, with the Milky Way being the final link. 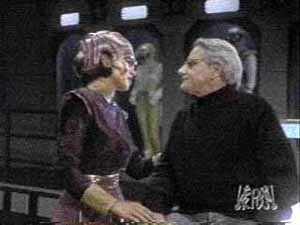 Aiding them were Klank (Oliver Page) and Orbus (Goodson), their top henchmen who oversaw many of the monsters’ missions. 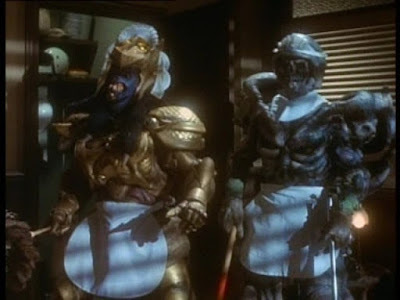 To quell any competition, they first assaulted Rita Repulsa (Carla Perez & Goodson) and Lord Zedd’s (Edwin Neal & Robert Axelrod) moon base, driving them and their minions into hiding with Rita’s father, Master Vile (Tom Wyner). The Machine Empire constantly attacked the Rangers with their endless supply of monsters and Cogs, the minor minions that took the place of Rita’s Putties. 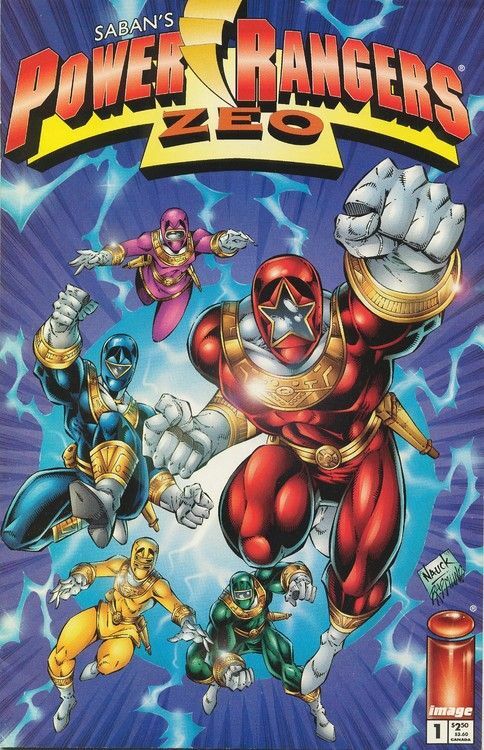 Rita, Zedd and their crew would return to plague the Rangers and the Machine Empire both as the series progressed. Skull, Bulk and Lt. Stone. Other returning characters included former bullies and current bumbling police officers/detectives Bulk (Paul Schrier) and Skull (Jason Narvy); Ernie (Richard Genelle), the owner of the Angel Grove Youth Center; Lt. Jerome Sloane (Gregg Bullock), Bulk and Skull’s supervisor on the police force who ended up fired because of their antics and opened his own detective agency; and Sam Trueheart (Frank Salsedo), the Native American who helped Tommy locate his piece of the Zeo Crystal as well as raised his long-lost brother, David Truehart (played by his real brother, Erik Frank). The Alien Rangers from season four also made a return appearance, marking the first time two incarnations of the franchise interacted with each other. These kinds of crossovers would become an annual event as the franchise continued. The Machine Empire approaches Earth. In the weeks preceding its debut, a serialized series of shorts aired along with reruns of Mighty Morphin season 3 and Alien Rangers taking the place of the episode teasers. 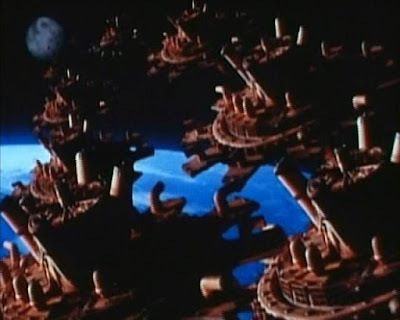 The shorts depicted the arrival of the Machine Empire to Earth and how the citizens of Angel Grove, as well as the previous villains, dealt with that and the fact that the Rangers were suspiciously absent. However, the shorts were rendered non-canon after the first two episodes of the series proper depicted the very different arrival for the Machine Empire. Following each short, more of the Zeo title was slowly revealed. Power Rangers Zeo debuted on FOX as part of the FOX Kids programming block on April 20, 1996. It utilized footage from Chouriki Sentai Ohranger, the 19th season of the Super Sentai series from Toei Company, Ltd., combined with original footage filmed with the American actors. In place of episode teasers, Zeo used cold openings for each episode. Ron Wasserman reworked his theme for Mighty Morphin to include the new Zeo aspects of the series, while Shuki Levy, Kenneth Burgomaster, Jim Cushinery and Jeremy Sweet contributed to the show’s overall soundtrack. Sloan, Jackie Marchand, Stewart St. John, Al Winchell, Brett D. Born, Mark Hoffmeier, Gilles Wheeler, Mark Litton, Richard Goodman, Steven Melching (as Buzz Alden), Charlotte Fullerton, Ron Milbauer, Terri Hughes, Joseph Kuhr, Tony Oliver, Barbara A. Oliver, Shell Danielson, Jim Suave, Colleen White, and Levy served as the series’ writers. International airings and the original intro for the pilot used an alternate logo that simply read ZeoRangers with the helmet visor shapes below it. Following the episode “Brother, Can You Spare an Arrowhead?” the Zeo intro would be shortened for the majority of the remaining episodes. Jason as the Gold Ranger. Although the ratings were initially high, the show stumbled as it progressed. To combat this, Saban sought to lure in older viewers by bringing back one of the original five Rangers: Jason Scott (Austin St. John). St. John had previously left the series over a monetary dispute, leading to his eventual replacement by Cardenas. Jason’s return was tied into the story arc featuring a mysterious Gold Ranger (who was actually the Black Ranger in the Sentai series, marking the first time a color was changed from the source material and predating the first actual Gold Ranger by 9 years) that would appear to help the other Rangers. 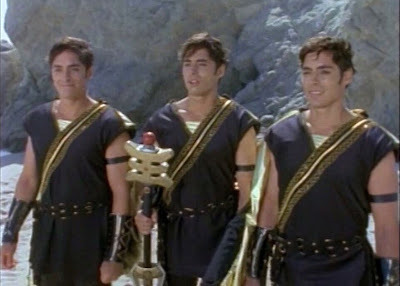 The Gold Ranger’s identity was kept secret, with clues being laid out to his identity being Billy, Skull and Tommy’s brother. 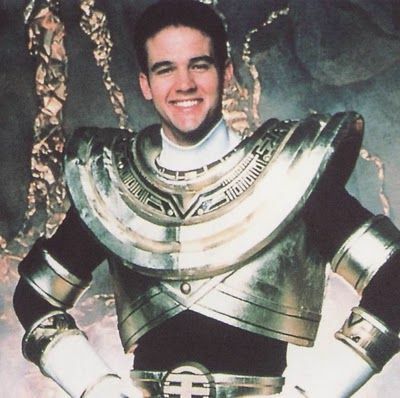 Initially, plans were to use the Gold Ranger to link the Power Rangers franchise to Saban’s other Japanese/American hybrid series, VR Troopers, by having his identity be Trooper Ryan Steele; which is why the morphed Gold Ranger’s voice was provided by Steele’s actor Brad Hawkins. Steele was also previously going to be integrated into Mighty Morphin as the White Ranger (later changed to Tommy). Plans were changed at the last minute and instead he became Trey of Triforia, the ruler of an alien planet who came to Earth seeking Zordon’s help. Along the way, Trey had ended up split into three different beings representing his aspects of Courage, Heart and Wisdom (played by triplets Ted, Tom and Tim DiFillippo, with Tom being the one inside the suit), which is what Triforians are made up of. Because of this split, they could no longer control their power and needed to transfer it to Jason until such time that they could reconstitute themselves into a single being. They also gave Rangers access to new Super Zeo Zords through the Super Zeo Gems, which were instrumental in the initial defeat of King Mondo and his monsters that had become enhanced with near-indestructible armor. Unfortunately, the powers proved incompatible with human physiology and eventually needed to be transferred back to Trey. Cestria helps an elderly Billy. Zeo ultimately came to an end with Rita and Zedd being the ones to successfully take out the Royal House, sending the Machine Empire into disarray. At 50 episodes, it marked the third season where Power Rangers exceeded the number of Ohranger episodes (in this case, by two). It also marked the departure of Billy, ending his stint as the longest-serving original Ranger. During production of the show, David Yost was having difficulty coming to terms with his homosexuality and was constantly harassed by the crew on set because of it. Yost left before the end of the season and his absence was filled by stock footage and voice actors. The character of Billy was written off as being rapidly aged by the regenerator he used in Alien Rangers to change himself back from a kid, necessitating his having to travel to planet Aquitar, the home of the Alien Rangers, for a cure. Falling in love with the Aquitian Cestria (Steffanie Malanga), Billy opted to remain there. This was also the final appearance of Rito as the costume for the character fell apart after filming and was never replaced. Image Comics' sole Power Rangers comic. Like with Mighty Morphin, Zeo had a line of figures and other merchandise primarily produced by Bandai. Bandai also released two video games: Battle Racers by Natsume for the Super Nintendo (which was essentially a Super Mario Kart clone using Ranger sprites) and Full Tilt Battle Pinball by Kaze for the PlayStation. Image Comics acquired the license to produce an ongoing comic series for the show in 1996, but it only ran for a single issue before Image lost the license. Four issues in total were written by Tom and Mary Bierbaum with art by Todd Nauck, and a proposed crossover with Image property Youngblood was advertised and partially drawn. The Zeo Rangers returned to comics as part of BOOM! Studios’ “Shattered Grid” event in 2018 and were depicted as being from an alternate universe. Following the event, Tanya was announced to be a member of a new team of Rangers that included the Ranger Slayer (an alternate future Kimberly), The Magna Defender, the Red Space Ranger, the Green Samurai Ranger and a mysterious Dark Ranger. Saban Home Entertainment released the two-part pilot episode to VHS as Power Rangers Zeo: Zeo Quest, followed by It Came From Angel Grove featuring the titular episode before it aired on television and a music video. In 2002, Walt Disney Home Video released Power Rangers Holiday Special which contained three holiday-themed episodes, including “A Season to Remember”. In 2012, Time Life Entertainment released Power Rangers: From Mighty Moprhin to Lost Galaxy containing the complete span of those shows over 40 DVDs. In 2013, Shout! Factory released Zeo as part of the Power Rangers: Seasons Four-Seven box set, and later independently across two volumes. They also released Power Rangers Legacy, which contained seasons 1-20 in a collectible Red Ranger helmet package. “A Zeo Beginning, Part I” (4/20/96) – The Rangers retrieve the Zeo Crystal; an amnesiac Rito and Goldar appear on Earth; the Machine Empire attacks Rita and Zedd. “A Zeo Beginning, Part II” (4/23/96) – The Rangers gain new powers and learn about the Machine Empire; Rito and Goldar become Bulk and Skull’s servants. “The Shooting Star” (4/24/96) – Tanya’s new boyfriend plans to cheat on his exams while Mondo plans to sabotage the Rangers’ new Zords. “Target Rangers” (4/25/96) – Rocky wants to ask his computer lab partner to the dance, but Mondo and Machina set their sights on their project for their next plot. “For Cryin’ Out Loud” (4/27/96) – Kat and Tommy have to pretend to be married for a school project, and Mondo plans to use the kid she’s babysitting against them. “Rangers in the Outfield” (4/29/96) – When Tanya strikes Shawn out, he becomes hostile towards her. “Every Dog Has His Day” (4/30/96) –The fire dog Katherine trained stumbles upon Mondo’s latest plot. “The Puppet Blaster” (5/1/96) – The Empire takes the friendly robot from a kids’ show and turns it into a monster that hypnotizes children to riot and act as shields against the Rangers. “Invasion of the Ranger Snatchers” (5/2/96) –Rocky, Ketherine and Tanya become extras in a movie while Sprocket plans to do some directing—of the end of the Rangers. “Graduation Blues” (5/4/96) – Billy doesn’t know what to do with himself now that he’s graduating early, but that problem is fixed when Cestro recruits his help on planet Aquitar. “A Few Bad Seeds” (5/6/96) – King Mondo transforms Rocky’s out-of-control botany project into his two newest monsters. “Instrument of Destruction” (5/7/96) – Adam and Skull end up in a music class on the advice of a guidance counselor. “Mean Screen” (5/8/96) – King Mondo sends a monstrous computer virus to Angel Grove which has the ability to affect even Zords. “Mr. Billy’s Wild Ride” (5/11/96) – King Mondo sabotages Billy’s spaceship as he makes his way back to Earth. “There’s No Business Like Snow Business, Part I” (5/13/96) – Kat and Billy take Tommy on a ski weekend to get over being dumped by Kimberly while Robocupid makes citizens fall in love with machines. “There’s No Business Like Snow Business, Part II” (5/14/96) – Tommy grows closer to a girl he met on the mountain while Mondo’s latest monster heats up Angel Grove. “There’s No Business Like Snow Business, Part III” (5/15/96) – Ranger business keeps Tommy from getting to know Heather, but it seems like Kat may have feelings for him instead. “Inner Spirit” (5/16/96) – Tommy meets a Native American who looks like the mystic who helped him find the Zeo Crystal while energy is being sucked out of Angel Grove. “Challenges” (5/18/96) – Tommy rescues Adam from Sprocket’s monster and discovers that he has a brother. “Found and Lost” (5/20/96) – As Tommy reconnects with his brother, Mondo plans to make use of him. “Brother, Can You Spare an Arrowhead?” (9/9/96) – Tommy has to save his brother from the Cave of Evil Spirits. “Trust in Me” (9/10/96) – Rocky tries to unsuccessfully befriend a blind martial artist while Mondo’s latest monster is designed to trick the Rangers. “It Came From Angel Grove” (8/20/96 VHS, 9/11/96 US)* – Adam has to deal with the Rangers who have been transformed into classic monster movie characters. *Released to VHS before it was aired. Dedicated to Carol Michelle Mickelson, a terminally ill fan who visited the set during the episode’s filming and died shortly before its release. “Bulk Fiction” (9/12/96) – Bulk tries to woo the Police Captain’s daughter, costing Lt. Sloane his job in the process. “Song Sung Yellow” (9/13/96) – Tanya’s chances for a singing career may be futile thanks to the Machine Empire. “Game of Honor” (9/16/96) – Machine Empire cloaking devices are scattered around Angel Grove, and Adam’s opponent in an upcoming fighting tournament happens to have one. “The Power of Gold” (9/17/96) – The mysterious Gold Ranger appears and saves the Rangers from the Wolfbane monster. “A Small Problem” (9/19/96) – Sprocket shrinks Tommy and Kat and puts them in a terrarium with a hungry tarantula. “A Season to Remember” (11/27/96) – A spell is cast on the Rangers that turn them into intolerable bigots against other cultures. “Oily to Bed, Oily to Rise” (9/20/96) – The Leaky Faucet monster puts toxic oil in Angel Grove’s water just as Kat is competing in a surfing contest. “Rock-a-Bye Power Rangers” (9/23/96) – The Gold Ranger must save the Rangers when a monster’s lullaby takes advantage of their run-ragged state. “Do I Know You?” (9/27/96) – Mondo teams-up with a bounty hunter who is after the Gold Ranger, while Bulk and Skull are hired to find a missing dog. “Revelations of Gold” (10/3/96) – The Gold Ranger asks the Rangers for help against bounty hunters while Rita and Zedd return to the moon to reclaim their empire. “A Golden Homecoming” (10/4/96) – Tommy recruits Jason to take on the Gold Ranger powers while Rita and Zedd restore Rito and Goldar’s memories. “Mondo’s Last Stand” (10/9/96) – Feeling rejected because of Jason’s return, Rocky faces Mondo alone when he comes to Earth for a powerful sword. “Bomber in the Summer” (10/11/96) – A group of tough teens prevent Ernie from opening his beach club, while Goldar and Rito lose the remote to Louie Kaboom after sending him to the Empire. “Scent of a Weasel” (10/23/96) – As Rita and Zedd try to regain control of Louie, the Rangers participate in a fashion show where Skull guards a supermodel. “The Lore of Auric” (10/25/96) – Aisha sends Tanya to an island where her parents disappeared, putting the Rangers into conflict with the ancient tiki Auric after Louie tries to control him. “The Ranger Who Came in from the Gold” (10/31/96) – Skull finds a statute that ends up turning Jason to gold while Louie takes over the Machine Empire. “The Joke’s n Blue” (11/5/96) – Bulk, Skull and a pair of rival detectives try to find out who’s playing practical jokes around the school as Prince Gasket plots to remove Louie from power. 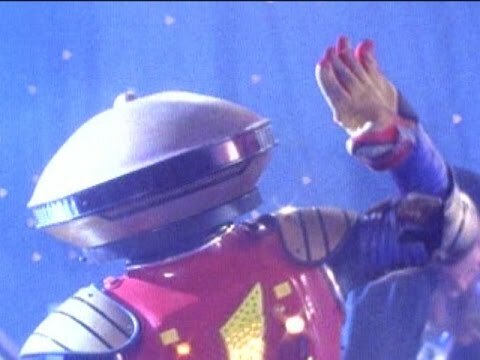 “Where in the World is Zeo Ranger 5?” (11/6/96) – Gasket kidnaps Tommy to use him against the other Rangers while Rito and Goldar try to repair the mobile base. “King for a Day, Part I” (11/7/96) – Tommy is brainwashed into believing he’s king of the Machine Empire and fights Jason in a parallel dimension. “King for a Day, Part II” (11/8/96) – Rita and Zedd decide to help the Rangers foil the Empire’s plan as Bulk and Skull end up stuck in the alternate dimension as well. “A Brief Mystery of Time” (11/11/96) – Tommy is the only one who notices that the same day is repeating over and over. “A Mystery to Me” (11/14/96) – Attending a whodunit party allows Archerina to capture all the Rangers so that she can destroy Kat. “Another Song and Dance” (11/15/96) – Tanya helps Tommy prepare to sing in class, but Machina casts a spell that forces them to constantly sing. “Rangers of Two Worlds, Part I” (11/20/96) – Rita attempts to turn Kat into a monster but hits her purse instead, and Billy suddenly becomes an old man as a side-effect of the regenerator. “Rangers of Two Worlds, Part II” (11/21/96) – The Alien Rangers return to help the Rangers defeat Mondo and Rita’s monsters and to take Billy to Aquitar for a cure. “Hawaii Zeo” (11/22/96) – Tommy asks Kat on a date to Ernie’s luau, which gets interrupted by Gasket and Archerina. “Good as Gold” (11/23/96) – Jason must return his powers to Trey or die, and all the villains would do anything to prevent that and acquire the power for themselves. #1 – Dr. Jewel heads to work at the observatory while the radio reports a disturbance in space. Aired with “A Friend in Need, Part III”. #2 – Dr. Jewel meets his colleague Dr. Kender inside as she opens the observatory roof. Aired with “Fourth Down and Long”. #3 – Rita and Zedd lament their victory over the Rangers. Aired with “Passing the Lantern”. #4 – Rita and Zedd argue over who gets to control the Earth when Rita spots something in her telescope. Aired with “Stop the Hate Master, Part I”. #5 – Rita refuses to convey what she saw while Zedd plans to celebrate. Aired with “Stop the Hate Master, Part 2”. #6 – Rita continues to refuse to say what she saw, and Zedd eventually finds out for himself. Aired with “A Ranger Catastrophe, Part I”. #7 – Rita wants to flee the coming Quadrafighter, but Zedd tries to rationalize that one ship doesn’t mean an invasion. Aired with “A Ranger Catastrophe, Part II”. #8 – A recap of Dr. Jewel’s arrival at the observatory. #9 – Dr. Kender and Dr. Jewel discuss the astronomical disturbance. Aired with “Changing of the Zords, Part I”. #10 – Dr. Jewel shows Dr. Kender a photo from his briefcase. Aired with “Changing of the Zords, Part II”. #11 – The photo is a telescope photograph of a Machine Empire Gear Ship, one of many entering the galaxy. Aired with “Changing of the Zords, Part III”. #12 – Reporter Wolfgang Blizzard reports on how quiet Angel Grove seems to be, at least until an observatory janitor calls with information about a ship he sees on the telescope. Aired with “Follow that Cab!”. #13 – The janitor describes the ship and points to the doctors as unwilling corroborators. Aired with “The Potion Notion”. #14 – Bulk and Skull catch Blizzard’s interview with the doctors. Aired with “A Different Shade of Pink, Part I”. #15 – Bulk and Skull decide to find the ship to prove themselves to the force and Lt. Stone. Aired with “A Different Shade of Pink, Part II”. #16 – Lt. Stone takes Bulk and Skull to a field and offers them the task of keeping an eye out for the ship, or cleaning the latrine with a q-tip. Aired with “A Different Shade of Pink, Part III”. #17 – Bulk and Skull fall asleep while on watch and the ship passes them by. Aired with “Another Brick in the Wall”. #18 – Seeing Bulk and Skull affirms to King Mondo that conquering the Earth will be easy. Aired with “A Chimp in Charge”. #19 – Dr. Kender refuses to confirm if the aliens are peaceful without more data, and Blizzard signs off reminding everyone that the Rangers have been missing. Aired with “Master Vile and the Metallic Armor, Part I”. #20 – Bulk and Skull wake up to the Gear Ship and promptly flee. Aired with “Master Vile and the Metallic Armor, Part II”. #21 – Exhaustion catches up with Bulk and Skull while they think about their discovery. Aired with “Master Vile and the Metallic Armor, Part III”. #22 – Bulk and Skull try to avoid contact with some Cogs. Aired with “The Sound of Dischordia”. #23 – Lt. Stone catches up to them and sees the Cogs before they begin firing on the trio. Aired with “Rangers in Reverse”. #24 – Bulk and Skull head to the Youth Center where they tell a disbelieving Ernie about the aliens. Aired with “Alien Rangers of Aquitar, Part I”. #25 – Ernie won’t believe Bulk and Skull until the governor confirms it. Aired with “Alien Rangers of Aquitar, Part II”. #26 – The governor confirms Bulk and Skull’s story, and the three of them faint when they learn the Rangers have proven unreachable. Aired with “Climb Every Fountain”. #27 – The governor urges the citizens to stay strong and pleads for the Rangers to appear. Aired with “The Alien Trap”. #28 – Mondo takes great pleasure in the fear their mere presence causes. Aired with “Attack of the 60’ Bulk”. #29 – The Royals are ready to begin their conquest as the last of the Quadrafighter scouts report in. Aired with “Water You Thinking?”. #30 – Bulk and Skull review the emergency supplies at the Youth Center. Aired with “Along Came a Spider”. #31 – Zedd refuses to abandon the Moon despite everyone’s urging as the Machine Empire draws closer to Earth. Aired with “Sowing the Seas of Evil”. #32 – Mondo and Machina decide to eliminate Rita and Zedd to prevent any obstacles in their conquest. Aired with “Hogday Afternoon, Part I”.